Globally, the World Health Organization estimates that at least 140,000 people currently die each year as a result of climate change while millions more are made ill (e.g., asthma, heatstroke, infectious disease) or otherwise physically harmed (e.g., from extreme weather events). In our spring 2014 national survey, we asked Americans to give us their best estimates of the impacts of global warming on human health worldwide – currently and 50 years from now. The largest proportion of respondents (38% to 42% – see table) simply said, “I don’t know.” The next largest proportion (27% to 39%) said either “no one” or “hundreds” of people worldwide will die, be made ill or injured by global warming each year, either now or 50 years from now. 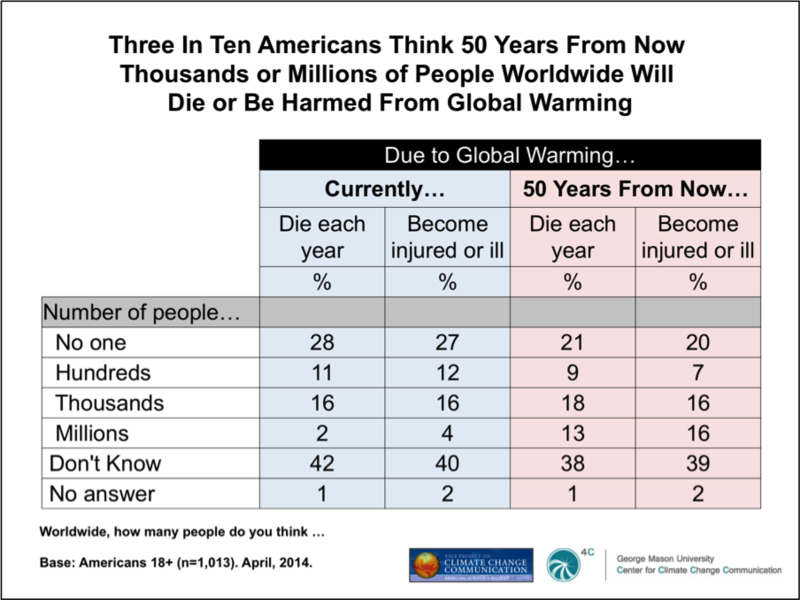 Only 18% to 32% of Americans said, correctly, that each year either “thousands” or “millions” of people worldwide will die, be made ill or injured by global warming, either now or 50 years from now. These results provide further evidence that most Americans have not yet connected the dots between global warming and impacts on human health. These findings are from our most recent survey, Climate Change in the American Mind, April 2014.